"Surprise is a very good thing for increasing consumption"
Amazing, isn't it? That is how I felt last weekend when I entered the supermarket for the first time after reading, "Salt, Sugar, Fat". This book,written by Michael Moss, has been an eye opening read for me. 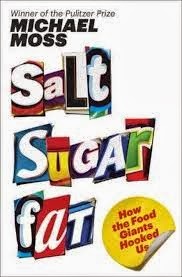 His book goes in depth on the realities of processed foods, grocery store marketing ploys and about the topic that is right up there with talking about politics; obesity. In Moss's book he is quick to build on the triangle of bliss that make us crave processed foods. He starts off by highlighting sugar. Sugar is a staple in our diets for sure, but the types of sugar are what Moss concerns us with. He mentions the Coke and Pepsi 'wars' and sums up the consumption of sugary soft drinks quite simply. "Everyone in the marketplace is constantly positioning... you were either going forward or you were going backwards. The other companies were constantly pushing you, trying to capture customers. And you gotta push back, because if you're not defining and delivering on your position, then you are by definition being positioned." The second topic mentioned by Moss was the war waged on fat. Fat, he describes, gives you the perfect 'mouthfeel' that is often used as a medium for your taste buds to enjoy the salt and/or sugar that accompanies the fat. Perfect example: Cheese! Cheese has been around forever and used to be considered a beautiful source of energy with exceptional taste. However, the birth of processed cheese has increased salt, fat and calories while still being affordable to customers. Moss also mentions that North Americans are now consuming ~33% more cheese due to people choosing other fat free dairy products such as yogurt and milk. Think about this for one second, have you ever went to the grocery store and picked up fat free yogurt, but grabbed a brick of processed cheese because it is on sale? By definition, some processed cheeses can stay stored in a factory cooler for two months before being shipped to a local market for sale. More added salt, more storage time! The third, and to me the most interesting ingredient Moss writes about, is "Salt". Salt can come in many forms; it can be small and powdered, large and crystallized, changed in sodium and preservatives, etc.. However, it somehow finds its way into virtually everything a connivence store has to offer. Sodium can lengthen shelf life, hit the taste buds where it counts and more salt can be added so products can be sold with 'less fat'. A perfect product example of this is peanut butter. Low fat peanut butter contains icing sugar and lots of sodium, that way it still tastes great and people will by it thinking that less fat is better......hmmmmm. Salt is the silent killer and the more you consume it the more likely you are to develop hypertension, obesity and other chronic cardiovascular issues associated with excessive salt intake. -First, read this book. Knowledge is power and knowing the information Moss provides will literally change the way you look at grocery stores and how you buy. You will literally see through the allusive products for what they really are. Trust me on that. -Lastly, think of yourself as someone who loves you would think of you. Would someone who loves you like to see you shop smarter, buy smarter and consume healthier options? Of course they would. No one wants to see people develop hypertension, gain excessive amounts of weight and develop cardiovascular problems. Rely on people who love you to help you eat better.